A Unique Experience with a Few Surprises: Exclusive to Costa Rican Vacations! EXCLUSIVE TOUR—Only with Costa Rican Vacations! 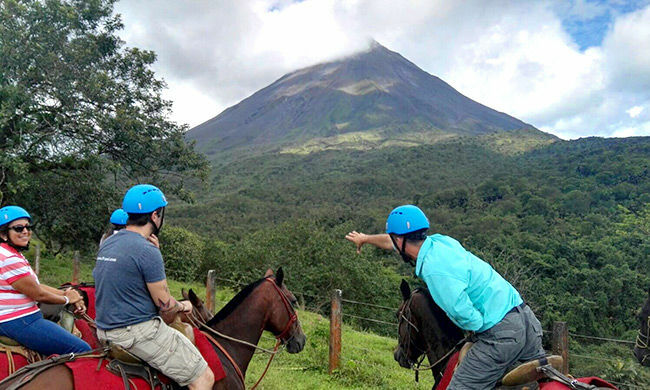 Experts and novice horseback riders alike will love this horseback adventure where you will take in the stunning scenery of the Arenal area. You’ll ride over gentle sloping hills to lookout points where you’ll see the Arenal Volcano and Lake before heading to a hidden spot for a picnic by a lagoon. This horseback riding tour is perfect for horse-lovers and those that enjoy being outside in nature. You’ll be picked up and driven to the starting point where your expert guide will set you up with a well-trained horse appropriate for your skill level. No experience required! As you set out through the private reserve, you will follow gently sloping trails that meander through farmlands and green pastures. You’ll discover the biodiversity of the area including flora such as ferns, bromeliads, woodlands, sugar cane, and giant fig trees. With luck you may spot some Costa Rican wildlife as well, including birds like the white hawk, Jacamar, mot-mot, trogons, and more. Once at the “El Silencio” Observation Point, you will be amazed at the majestic Arenal Volcano towering above. Your guide will point out the dry lava trails that mark the mountainside before you continue on horseback to a hidden spot with the best view of the Arenal Lake and picturesque surrounding mountains. Finally you’ll arrive at a small, secluded lagoon where you’ll be surprised by an intimate picnic set up by the edge of the water. After a light lunch, you can row out onto the lagoon and explore its shores before returning to your horses. A short ride will return you to the transfer which will take you back to your hotel. Tour includes: transportation, bilingual guide, all equipment, picnic lunch, water. What to bring: sunscreen, bug spray, long pants, closed shoes, camera.